Select one of the products below for specific frequently asked questions. We’re so confident that you are going to love our Panda products, that we are offering you a 30-night trial period. If you are unhappy with the products (which we highly doubt! ), we will happily give you a full refund, as long as you have the receipt and return the pillow to us within the 30 night period. We are very open to any feedback that you have to help us improve our products. How does the 10 Year Guarantee work? Yes, it’s true, we aren’t saying it just to sound good, we do offer a full 10-year guarantee period! If there is a problem with your product during the warranty period, we’ll exchange it for a brand new one. If your product has been discontinued, we will provide you with the updated version of said product so you will never be without the comfort of Panda. During this period, you may be required to send your item back to us for a quality test to ensure that any errors are corrected quickly and efficiently. The warranty covers any physical flaw in the product despite normal usage and proper handling. The warranty does not cover conditions resulting from normal wear and tear. Is this the same bamboo that the Giant Pandas eat? The Bamboo textiles are made using Moso, Dragon and Ci Bamboo – which is not the type of Bamboo that Pandas eat. The Moso, Dragon and Ci Bamboo kinds are grown organically without using any pesticides or fertilizers, as the plants’ natural antifungal, antibacterial agent Bamboo Kin means they are not attacked by pests or pathogens. The bamboo used in our bed linen is grown organically without using any pesticides or fertilizers. Bamboo is a very fast growing grass and relies purely on rainfall. It absorbs more CO2 and produces 35% more oxygen than the same area of trees. Bamboo fabric is biodegradable as well as hypoallergenic. Are they any harmful chemicals used? Each Panda item has been tested for any nasties in the fabrics in accordance to Oeko-Tex© Standard 100. So you can rest assured that there have been no harmful chemicals used when manufacturing any of our products. All of our products are free from any harmful chemicals such as formaldehyde & toluene diisocyanate. All our products are Oeko-Tex® Standard 100 certified. This global testing and certification system is the strictest in terms of cleanliness and purity of products, ensuring they comply with health standards and are safe for babies. Yes, and we highly recommend that you do! All of our outer boxes and 70% of the paper we use in our office is made from kraft paper. Kraft paper is a 100% biodegradable natural product. The pulp is made from long virgin fibres of maritime pine and is not bleached, to ensure minimum chemical processing and to retain the wood’s natural colour. Kraft paper biodegrades entirely naturally. Just like the leaves from the trees, kraft paper decomposes naturally within a few weeks, returning to its initial form of cellulose fibres, which can be fully assimilated back into its original natural environment, with no adverse impact on nature or human health! What safety certificates do the pillows and sheets have? Each Item has been tested for any nasties in the fabrics in accordance to Oeko-Tex© Standard 100. The Filling materials in the pillows have been tested and found to comply with Ignition Source 2 as specified in Schedule 2, Part 1 of the Fire Safety Regulation 1988. Are your products free from chemicals? Our products are made from certified organic bamboo that is grown and produced without any harmful chemicals, artificial additives, growth hormones and GMOs. They all passed the Oeko-Tex Standard 100, which is an international testing and certification system for textiles, focusing primarily on limiting the use of harmful chemicals in the textile industry. The certification body tests for over 100 harmful substances in the manufacture of textiles and makes sure none is left in the fabric at the end of the manufacturing process. The Bamboo fibre is twice as soft as cotton with a silky cashmere touch. The fabric itself is environmentally friendly, needing no more than a 30-degree wash and dries in half the time of cotton. Although Bamboo is 99% of a panda’s diet, they don’t mind sharing! How can I clean my sheets and pillow case? We recommend the sheets and pillowcases to be washed using a 40-degree wash and then be hung out to dry. Are the bed sets and pillowcases hypo-allergenic? Yes, bamboo is naturally antibacterial which helps to protect against skin irritation and allergies, making our bed sheets and pillowcases suitable for those who suffer from eczema, sensitive skin or hay fever caused by dust mites. What materials are used for the packaging? We use Kraft paper to make our packaging. It is 100% biodegradable, 100% recyclable and it has great durability to protect our amazing products! Yes, you will need to be at home as our courier service requires a signature to let us know you have received the item. If you are not at home they will attempt to re-deliver within 1-2 days*, you can re-arrange delivery dates after the first attempt. Please email our customer support team for more information. Delivery to the UK is free when you spend £35 or more and will take 2-5 days to arrive. Typically, you should receive your items together. However, due to constant fluctuations in stock, there may be instances where you would receive items separately. What is the weight of the products? The pillow weighs 1.8 kg including all packaging. The bed sheet set weighs 3.2 kg including all packaging. What is the height of the pillow? The pillow height is 12cm top to bottom without pressure. The pillow will mould to your body according to your natural head & neck shape in order to give you the best support thanks to the memory foam. What are the Panda Pillows made from? Our pillows are made up of three layers of visco memory foam using the newest technology of memory foam gel which is recommended by doctors and orthopaedic experts. The Panda bamboo pillow size is 60(L) x 40(W) x 12(H) cm. Why use three layers of memory foam? The structure provides the perfect neck support to relieve pressure points and prevent joint pain whilst guaranteeing a perfect night’s sleep! Does this support back sleepers? Yes, the original Panda Memory Foam Bamboo Pillow features three layers of 3rd generation memory foam for ultimate support and comfort. The memory foam conforms to the shape of your neck and shoulders, which offers maximum support. This also helps to relieve pressure points! Will it help stomach sleepers? Yes, As a stomach sleeper your head & neck don’t need to be raised as much compared to side and back sleepers. The Panda Memory Foam Bamboo Pillow will accommodate this sleeping position and will be as flat as your body requires. Whilst ensuring maximum comfort and support, all night long. Our products are made from certified organic bamboo that is grown and produced without any harmful chemicals, artificial additives, growth hormones, and GMOs. They all passed the Oeko-Tex Standard 100, which is an international testing and certification system for textiles, focusing primarily on limiting the use of harmful chemicals in the textile industry. The certification body tests for over 100 harmful substances in the manufacture of textiles and makes sure none is left in the fabric at the end of the manufacturing process. Do you need to use pillow cases with these pillows? The pillow comes with a hypoallergenic and highly breathable pillowcase made of bamboo. The bamboo cover is easy to remove and wash. However, you can use your own pillowcase above it but it is totally up to you. Is the Panda Memory Foam Bamboo Pillow eligible for the 30-Night Trial? Panda Memory Foam Bamboo Pillow does come with a 30-night trial. If at any point during your 30-night trial you’re not satisfied simply get in contact! What is the recommended age for this pillow? 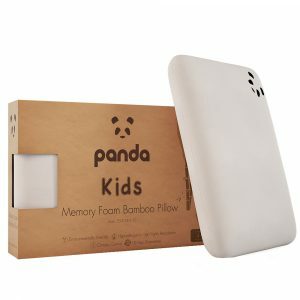 The Panda Kids Memory Foam Bamboo Pillow is suitable for children aged 4-7 years old. Although, some adults do prefer sleeping on a slightly thinner pillow and the Panda Kids Memory Foam Bamboo Pillow is a great solution. What's the difference between the Toddler & Kids Pillow? 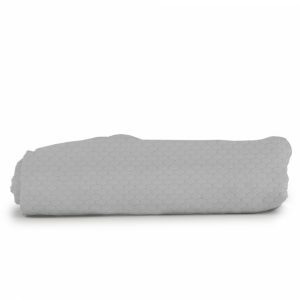 The Panda Kids Memory Foam Bamboo Pillow is made up of two layers of 3rd generation viscose memory foam. This is the same memory foam mould that we use for our standard sized Panda Memory Foam Bamboo Pillow. The Panda Toddler Memory Foam Bamboo Pillow does not feature this as it would be too high for younger children. The Panda Toddler Pillow is designed for babies, this pillow is able to provide the support required for this age group. How do kids benefit from this pillow? The Panda Kids Pillow is lightweight and not too tall. It was designed to be the ideal shape and size for supporting your child’s head, neck and shoulders. Will this help with my kid’s allergies? The Panda Kids Memory Foam Bamboo Pillow comes with a bamboo fibre cover, which is naturally hypoallergenic and keeps dust mites at bay. What’s the difference between this and an adult one? Is it just smaller in size? 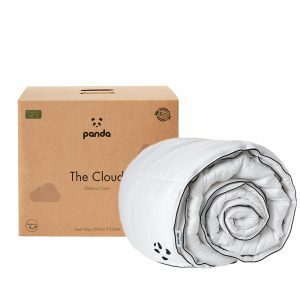 The Panda Kids Memory Foam Bamboo Pillow is made up of the same high-quality 3rd generation memory foam as the Panda Memory Foam Bamboo Pillow. However, the Panda Memory Foam Bamboo Pillow is made up of three layers of memory foam, whereas the Panda Kids Memory Foam Bamboo Pillow is made up of two layers of memory foam. The Panda Kids Pillow is able to offer the same amount of comfort and support as the standard Panda Pillow but for children. The Panda Kids Pillow is the perfect size for children aged 4 – 11 years old. Is this pillow suitable for children with sensitive skin? The bamboo cover that comes with our Panda Kids Pillow is highly breathable and soft, so it is gentle towards sensitive skin. The pillow will help prevent skin irritation and creases. My kid is a restless sleeper, will this pillow help? The Panda Kids Pillow is made of memory foam, which adapts to the little sleeper’s contours. This means your child will be properly supported and comfortable, which will likely reduce the need to toss and turn during the night. What kind of memory foam do you use? 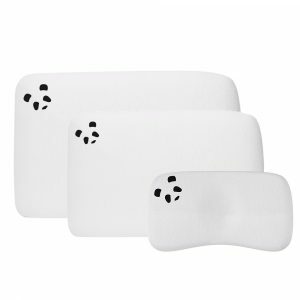 The Panda pillow is made of three layers of visco 3rd generation memory foam. There’s a very firm layer in the centre, giving the pillow its structure, and two softer layers around it, making the pillow feel more comfortable. How does it feel to sleep on it? The pillow adapts to your sleeping position and provides the support you need. The bamboo cover around it is incredibly soft and breathable. Bamboo materials regulate temperature well, meaning you’ll feel warm in the winter and cool in the summer. Plus, there will be no moisture and odour retention, allowing for a comfortable and peaceful sleep. Our products are designed in the UK and made in China. Kids get to sleep through the night using our pillow, and they wake up feeling well rested and ready to take on the day. Plus, the cute panda face in the corner of the bamboo cover is a hit! I have the adult pillow and I love it but it’s slightly too high. Would the kids version be ok or too thin? Although this Panda Pillow is specifically designed for children, we do find that some customers prefer this version compared to the standard Panda Memory Foam Bamboo Pillow. There is never one pillow which is suitable for everyone, this is because everybody sleeps in a different way and have their own preferences. Using the Panda Kids Pillow could be a solution if you are finding the Panda Pillow to be too high. 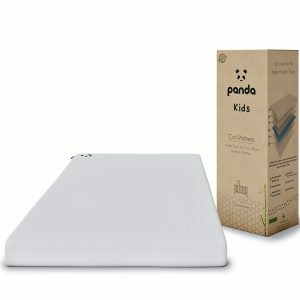 The Panda Kids Memory Foam Bamboo Pillow is made up of the same high-quality 3rd generation memory foam as the Panda Memory Foam Bamboo Pillow. 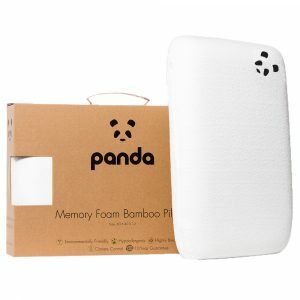 However, the Panda Memory Foam Bamboo Pillow is made up of three layers of memory foam, whereas the Panda Kids Memory Foam Bamboo Pillow is made up of two layers of memory foam. The Panda Kids Pillow is able to offer the same amount of comfort and support as the standard Panda Pillow. What is the height of the Panda Toddler Pillow? Our Panda Toddler Memory Foam Bamboo Pillow is approximately 3cm in height, we found that this is the perfect height for a memory foam pillow for toddlers. After consulting a series of doctors and orthopaedic experts, we learned that memory foam pillows of this size are highly recommend to properly support the child’s neck and spine. You should have received a leaflet with your new Panda Mattress Topper. On the off chance you didn’t receive one or you lost it, click here to download the Setup Guide PDF. Will the Topper slide about on top of my mattress? The Topper has an Anti-Slip Layer at the base. Micro-silicone grips embedded within the entire base prevents any unwanted movement between your mattress and the Topper. It also features four secure elastic straps to keep the Topper in place. How do I know if the Topper is suitable for my bed? The Topper is available in a range of different sizes, always check before purchasing that you’re ordering the right size. Each corner has a durable elastic strap, making the Topper suitable for all types of mattresses. How is the Topper by Panda better at keeping us cooler during the night? The minute capsules of cooling gel incorporated into our 3rd generation memory foam, help prevent overheating throughout the night. Making the Topper by Panda, the most advanced memory foam mattress topper available. What is the Bedding's thread count? 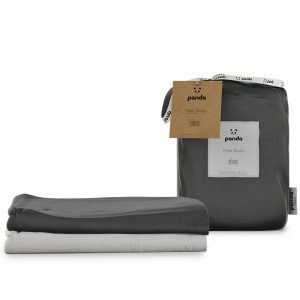 The Panda 100% Bamboo Bedding has a 300 thread count. The nature of the fabric gives our 200 thread count a feel comparable to that of 1,000-1200 in other fabrics such as cotton. 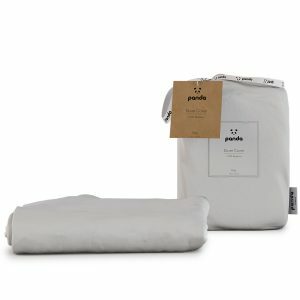 What are the bedding sets and pillowcases made from? Our bedding sets are made out of 100% bamboo fabric. The nature of this fabric gives our 400 thread count a feel that is comparable to that of 800-1200 in other fabrics. 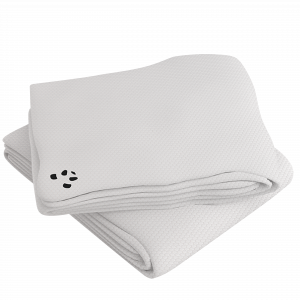 Our pillowcases are made of 60% polyester and 40% Bamboo viscose, which is a combination we found was good at increasing both breathability and comfort. Are there any harmful chemicals used? NO! Each Item has been tested for any nasties in the fabrics in accordance with Oeko-Tex© Standard 100. So you can rest assured that there have been no harmful chemicals used when manufacturing any of our products.